Friday, the 15th of September, 1654. RESOLVED, upon the Question, That the House do, on this Day Fortnight, take up the Debate concerning the Calling-up of Ministers, according to the former Order. Ordered, That the Committee of Privileges be revived, and do sit this Afternoon, in the same Place. The Clerk, according to the Order Yesterday, did this Day bring in the Original Record of the Government of the Commonwealth: Which, by Command of the House, was now read. Resolved, That the Debate upon the Government, now read, be adjourned till Monday Morning, the first Business. 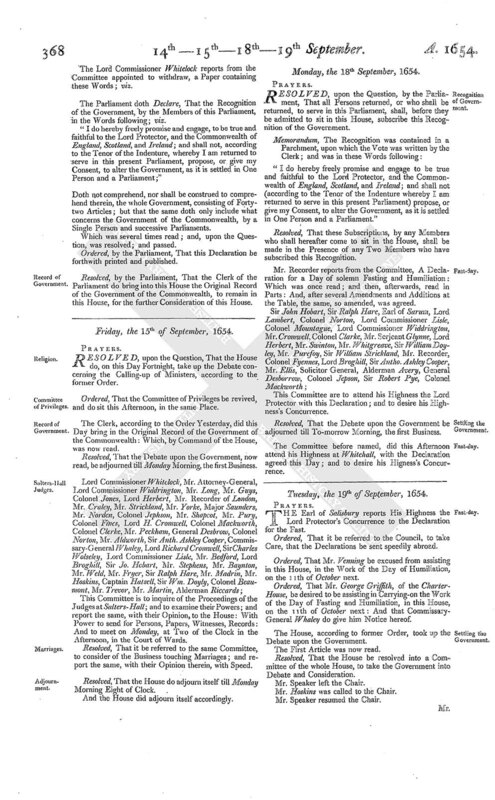 This Committee is to inquire of the Proceedings of the Judges at Salters-Hall; and to examine their Powers; and report the same, with their Opinion, to the House: With Power to send for Persons, Papers, Witnesses, Records: And to meet on Monday, at Two of the Clock in the Afternoon, in the Court of Wards. Resolved, That it be referred to the same Committee, to consider of the Business touching Marriages; and report the same, with their Opinion therein, with Speed. Resolved, That the House do adjourn itself till Monday Morning Eight of Clock. And the House did adjourn itself accordingly.